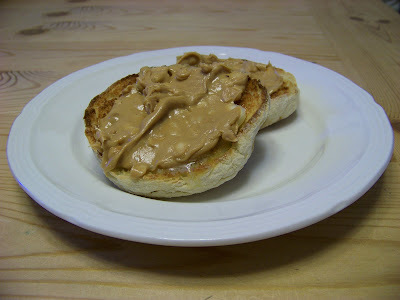 Breakfast is ..... toasted English muffins slathered in real butter and crunchy peanut butter. I'd tell you that this looks good, but hmmmmmm not so much. I'm sure it tasted yummylicious, though. Why that looks good enough to eat! when i am in the right mood that would be awesome. but more often than not i just can't be bothered with peanut butter unless it's in some sort of chocolate candy. I think I love you ... crunchy PB is the ONLY way to go.